A state-of-the-art athletic complex will serve as a powerful recruitment tool for University Liggett School. Facing increasing competition for new students, the nationally recognized K-12 private school commissioned HOK to create an athletic facility master plan to elevate the campus sporting experience for students. The design team worked with students, parents, coaches and donors to balance the needs of students of all ages for physical education, club sports and competitive team sports. Collaborative workshops and design sessions helped build consensus for a program that provides the most value for Liggett. The first phase includes one of the nation’s largest single installations of synthetic turf athletic fields to support football, baseball, softball, soccer, lacrosse and field hockey. This new field design will allow the site to retain more rainfall and mitigate drainage and water runoff issues. Scheduled to begin construction in 2015, the second phase is the 46,000-sq.-ft. Campus Athletic Center that will include a welcome center, a new gymnasium, a fitness and training facility, squash courts, multi-purpose event/meeting space, locker rooms, athletic offices and an outdoor plaza. 46,000 sq. ft. / 4,275 sq. 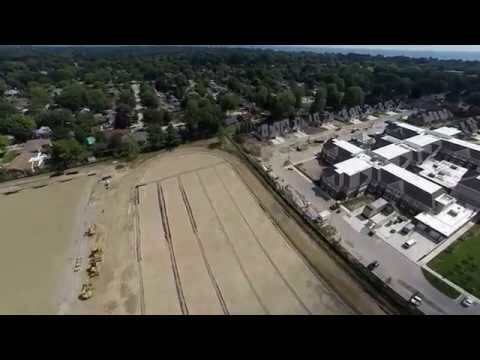 m.
Watch a flyover video showing construction on the University Liggett School Athletic Complex.